If you're like me, you love anything with rhubarb in it. Thankfully, we have a bunch of rhubarb plants that come up faithfully every year. This spread is so incredibly easy. And delicious. It doesn't last long around here. First thing you need, is some fresh rhubarb. Remove the leaves if you haven't already, wash them, and chop them into 1/2 in long pieces. Place them in a stainless steel pain and add 2 cups of sugar. Mix it around a bit, then leave it to sit over night. The next day, add 1/4 cup water to the pan. Bring it to a boil, then simmer it for 15 minutes. Remove from heat & stir in the jello package. Make sure it is completely dissolved. Then you are left with this! Place into jars with tight fitting lids & refrigerate. It can also be frozen, which is nice to find in the fridge in the middle of the winter! I have to mention.. these photos are so old! 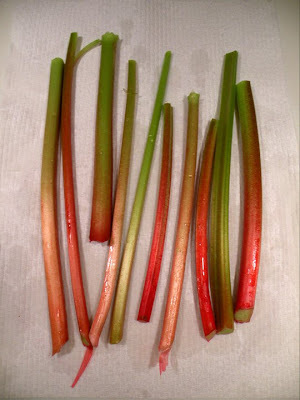 I was going to take photos for this recipe this spring, but since spring is rhubarb time, I didn't want to wait.